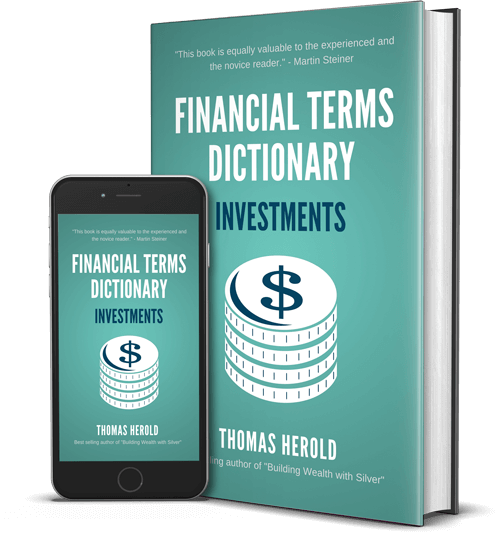 This practical financial dictionary for Investment terms helps you understand and comprehend most common Investment lingo. It was written with an emphasis to quickly grasp the context without using jargon. Each of the Investment terms is explained in detail and also gives practical examples. This book is useful if you are new to business and finance. It includes most accounting terms for businesses, investors and entrepreneurs. It also covers the lingo that was introduced in the financial crisis of 2008 until 2017. With the alphabetical order it makes it quick and easy to find what you are looking for. Example Term: What is a Gold Roth IRA? Gold Roth IRA’s are IRA’s that are allowed to contain gold and other precious metals. Gold Roth IRA’s make sense for many investors. This is because gold and other precious metals like silver and platinum have been considered to be the greatest form of long term storage for cash and valuables throughout history. This means that gold in particular could be considered to be the best asset for retirement. Although there are many other types of instruments used for retirement accounts and planning, including bonds, stocks, savings, and annuities, gold is the only one whose final value does not rest on an institution or individual’s performance or success. This makes physical gold an ideal means for saving for retirement. Gold Roth IRA’s are specially created either through initially funding one or by rolling over a Roth IRA or traditional IRA to a gold backed Roth IRA. Rolling over an existing employee held 401K to a Gold Roth IRA can be difficult if the employee has not left the company. This is because employees are not usually allowed to do rollovers until they separate from their company. IRA’s that already exist can be transferred to Gold Roth IRA’s. They can be moved from credit unions, banks, or stock broker firms to a trust company that is allowed to hold your Gold IRA holdings. In this type of transfer, you could choose to move securities held in the account along with cash, or cash by itself. Gold Roth IRA’s must be created by sending in cash to the administrator of the IRA. They will then purchase the gold, silver, or platinum physical holdings as you instruct them. The gold must then be kept by a gold IRA custodian on your behalf. These depositories provide safe places for the gold, as well as easy access to buy or sell it. The gold kept in a Gold Roth IRA may not be sent to your house or assumed in your personal possession. Instead, it has to be liquidated before the funds from it can be accessed. Gold that is requested as a distribution will be penalized at your personal tax rate plus a ten percent penalty. Only certain forms of gold and precious metals are allowed to be purchased and held within a Gold Roth IRA. Gold bars have to demonstrate a twenty-four karat purity to be eligible. They can be one ounce, ten ounces, a kilogram, one hundred ounces, or four hundred ounces in size. Gold coins that are permitted are twenty-four karat bullion coins from the United States, Canada, Austria, and Australia. The most heavily minted gold coins of all time, the South Africa Krugerrand’s, are not permitted, as they are only twenty-two karats. Silver bars and coins that have .999 or higher purity are permitted to be held in a Gold Roth IRA account. This allows the Canadian Silver Maple Leaf, the U.S. Silver Eagle, and the Mexican Silver Libertad one ounce bullion coins. Silver bars that are one hundred ounces and one thousand ounces are also permitted.